The letter O is one of only a handful of letters in our alphabet whose shape hasn’t changed much throughout its entire history. We can be fairly sure that O’s earliest ancestor was a Phoenician letter, ayin, that was based on a drawing of a human eye (hence O’s circular shape) and was in turn descended from a similarly shaped Egyptian hieroglyph. In these ancient languages, however, O—or, at least, its eye-shaped ancestor—probably represented a consonant, and it took the Ancient Greeks to adopt it and use it to represent their letter omicron to transform our humble O into a vowel. 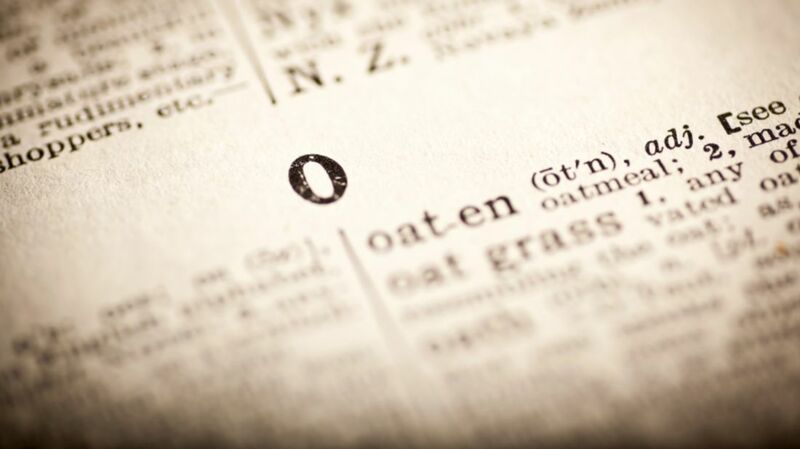 Nowadays, O is one of the most-frequently used letters of our alphabet, accounting for just over 7 percent of a standard page of text and just over 3 percent of all the words in a standard dictionary—including the 40 outstanding O words outlined here. Derived from a Latin word meaning “to contradict,” if you obacerate someone then you stop them from talking. Obambulation is the act of wandering around, and anyone (or anything) described as obambulatory is doing precisely that. An ob-and-soller, according to the Oxford English Dictionary, is “a person who engages in scholastic disputation”—or, more loosely, a hair-splitting, pedantic nitpicker. The term was coined in 1678 by the English poet Samuel Butler, who based it on the older expression “obs and sols,” which was used to refer to the “objections and solutions” to a problem or issue being debated. To ride away on a horse. … then you’ll be obfuscated—which literally means “overshadowed” or “placed into shade,” but was used as a euphemism for drunkenness in Victorian slang. Derived from the Latin word for a dog’s bark, any written work described as oblatrant would rail against or condemn another work. To obligure is to eat a great meal—while to obligurate is to spend time feasting or banqueting. An old-fashioned word derived from the French word for “eye” for an amorous or knowing glance. Oxen are proverbially stubborn creatures, so an ox that’s having an off day must be particularly irritable—which explains why off-ox became a nickname for an unmanageable, bad-tempered man in 19th century American slang. An old English dialect word for the choicest or most delicious foods. The prefix oligo–, derived from a Greek word meaning “few” or “small,” is used to form opposites of words beginning with the prefix poly–, meaning “many.” So if a polyglot is someone who speaks a number of languages, then oligoglottism is a very limited knowledge of languages. Likewise an oligosyllabic word is one with very few syllables; an oligophagous creature is one with a very limited diet; and an oligopoly is a market in which there are only a limited number of vendors. … then you’re extremely well-read or familiar with a great amount of literature, while an omniloquent person is able to talk about any possible subject. A half-Latin-half-English word (also spelled omnigatherum) for a random assortment of things, or an odd-job man or jack-of-all-trades. … is another word for a poor night’s sleep caused by, or worsened by, bad dreams or nightmares. An old English dialect word used to describe something that will soon run out or will soon be finished. Derived from Yiddish expression gelt afn tish, literally meaning “money on the table,” ooftish or oof was slang for money or cash in late 19th century–mid 20th century English. Likewise, you could be oofless—or, in other words, poor or bankrupt. Derived from the local name of a type of sparse grass or weed that grows among corn, ooga-tooga is an old nickname from the far north of Scotland for the scanty hairs on top of a balding man’s head. Reportedly one of the commonest of all phobias, if you’re ophidiophobic then you’re scared of snakes. Other O-phobias include ochlophobia (the fear of mobs), ornithophobia (birds), oneirophobia (dreams or dreaming), optophobia (opening your eyes), ochophobia (vehicles), odontophobia (teeth or dentistry), and oikophobia (the hatred of going home). The medical name for the back of your hand. An opsimath is someone who only begins to study or learn in old age, while opsimathy is learning or education acquired in later life. Opsigamy, similarly, is the act of getting married late in life, while an opsigamist is someone who does precisely that. … is a formal word for the catering or serving of food. If you arrive opunctly, then you arrive right on time. If the collar of your shirt doesn’t match the rest of it in color or fabric, then it’s an orphan-collar. An alternative (and much better) word for an ear trumpet. To out-swift, outspeed, or out-trot someone is to overtake them. Derived from a French word essentially meaning “out of bounds,” outrance or oultrance is an old 15th century word for the greatest or furthest degree of something. That being said, you typically wouldn’t see outrance being used on its own—instead, it tends only to be used in phrases like to the outrance (meaning “to the very end”), to fight to the outrance (“to fight to the death”), or at outrance (“at the very last extremity”). Another French-origin word, meaning excessive over-bearing arrogance or self-esteem. If something is overwaist, then it’s submerged in water. A 16th century nickname for twilight.